The department of Health and Human Performance held its annual Research Symposium on Oct 22nd and 23rd, 2018 in the Rockwell Pavilion - M.D. Anderson Library at the University of Houston. 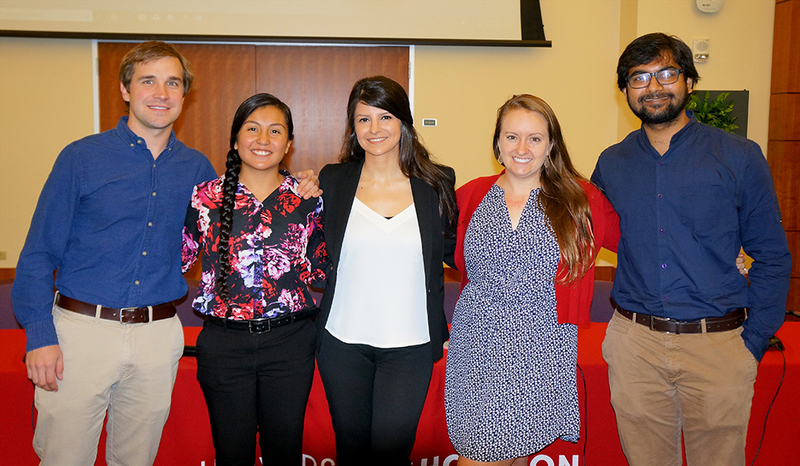 Audience members listened as HHP students and faculty presented their research, over two days, on a wide variety of topics, including Kinesiology, exercise science, obesity, physiology and sports administration. HHP students competed in the “elevator speech” contest during which students give a two minute informative and persuasive sales pitch of their research to a panel of judges. The top two contestants receive funding to support their research. The winning contestant was Mr. Nishant Rao with Mr. Kyle Leister in the second place. The symposium also featured two panel discussions. The discussion titled "Exploring Sport Practitioners Use of Research", was led by Dr David Walsh with Chris Canetti, President-Houston Dynamo, Doug Hall, VP Special Projects-HC Houston Sports Authority and Jason Kohll, CEO, Professional Sports Partners. The second discussion titled "The Benefits of Corporate Social Responsibility to the Sport Management Curriculum and Field" was led by Dr. Joyce Olushola Ogunrinde with Renee Zlovenski from the Special Olympics.